One of the finest American handmade pianos of our day, they are sometimes referred to as the Steinway & Sons of the 21st century. This 43 ½” vertical is called a “console” only for marketing purposes because of its traditional homestyle décor and fine furniture, Italian Provincial styling and American walnut finish. In reality, the Charles Walter model 403 console piano is a studio upright by virtue of its studio-sized action and longer strings, giving you a stately, handsome furniture cabinet without any sacrifice of tone quality. It will perform better than most other console pianos because of this, and rival other studio upright models. It uses no particle board in the cabinetry, which is very substantial and beautifully finished. All case parts are of 5-ply lumber-core and solid hardwood construction. All parts of the piano are carefully sanded, given multiple coats of specially formulated lacquer, hand-rubbed and polished. The finish consists of genuine American walnut veneers. The music desk features a custom antique brass inset, true to the period. The Boston fallboard gently covers the keys and glides effortlessly to protect the sides. The matching bench is original and is duet-sized for two players. 88 Keys Piano Warehouse & Showroom – $4450. 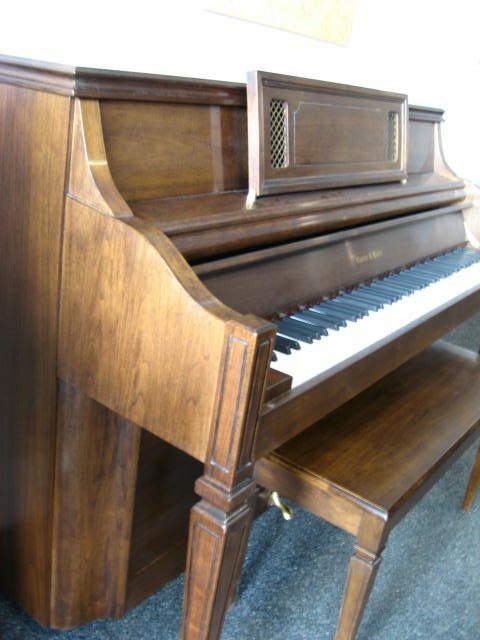 It offers an American-made Langer piano-action by Herrburger Brooks. Exceptionally long, thick keys that are individually lead-weighted provide a very even feel across the keyboard. The scale design is well thought out and the bass sounds good all the way to the bottom. The treble sings beautifully. The Delignit pinblock keeps the tuning pins tight between tunings for decades, providing a more enjoyable playing experience. The Walter Piano Co. of Elkhart, Indiana is unique among US piano manufacturers in that it is a family business, staffed by Charles and his wife Barbara, several of their grown children and in-laws, in addition to unrelated production employees. Charles is an engineer and prior to building his namesake instrument he headed Piano Design and Engineering for a piano manufacturer doing important research on musical acoustics. Each piano is inspected by a family member before being shipped and that person’s signature can be found on the top of the piano back, underneath the lid. Only 1450 pianos were built during the year of this pianos production. “I strongly recommend checking out the Charles Walter pianos if you’re shopping for a vertical in the middle to upper price range… and is a good value for the money” Larry Fine, “The Piano Book”. Italian Provincial style and American Walnut finish adorn this Charles Walter model 403 Console Piano.